A major survey by the Pew Forum on Religion & Public Life finds that most Americans have a non-dogmatic approach to faith. A strong majority of those who are affiliated with a religion, including majorities of nearly every religious tradition, do not believe their religion is the only way to salvation. And almost the same number believes that there is more than one true way to interpret the teachings of their religion. This openness to a range of religious viewpoints is in line with the great diversity of religious affiliation, belief and practice that exists in the United States, as documented in a survey of more than 35,000 Americans that comprehensively examines the country’s religious landscape. This is not to suggest that Americans do not take religion seriously. The U.S. 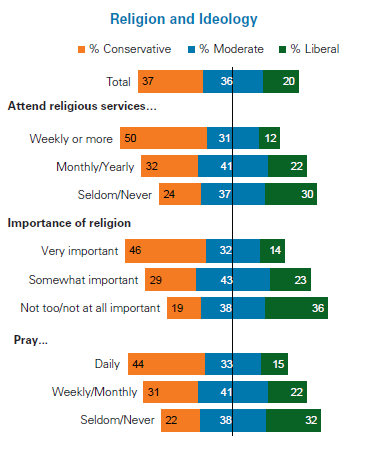 Religious Landscape Survey also shows that more than half of Americans say religion is very important in their lives, attend religious services regularly and pray daily. Furthermore, a plurality of adults who are affiliated with a religion want their religion to preserve its traditional beliefs and practices rather than either adjust to new circumstances or adopt modern beliefs and practices. Moreover, significant minorities across nearly all religious traditions see a conflict between being a devout person and living in a modern society. The Landscape Survey confirms the close link between Americans’ religious affiliation, beliefs and practices, on the one hand, and their social and political attitudes, on the other. Indeed, the survey demonstrates that the social and political fault lines in American society run through, as well as alongside, religious traditions. The relationship between religion and politics is particularly strong with respect to political ideology and views on social issues such as abortion and homosexuality, with the more religiously committed adherents across several religious traditions expressing more conservative political views. On other issues included in the survey, such as environmental protection, foreign affairs, and the proper size and role of government, differences based on religion tend to be smaller. Most Americans agree with the statement that many religions – not just their own – can lead to eternal life. Among those who are affiliated with a religious tradition, seven-in-ten say many religions can lead to eternal life. This view is shared by a majority of adherents in nearly all religious traditions, including more than half of members of evangelical Protestant churches (57%). Only among members of the Church of Jesus Christ of Latter-day Saints and other Mormon groups (57%) and Jehovah’s Witnesses (80%), which together comprise roughly 2.4% of the U.S. adult population, do majorities say that their own religion is the one true faith leading to eternal life. Most Americans also have a non-dogmatic approach when it comes to interpreting the tenets of their own religion. For instance, more than two-thirds of adults affiliated with a religious tradition agree that there is more than one true way to interpret the teachings of their faith, a pattern that occurs in nearly all traditions. The exceptions are Mormons and Jehovah’s Witnesses, 54% and 77% of whom, respectively, say there is only one true way to interpret the teachings of their religion. 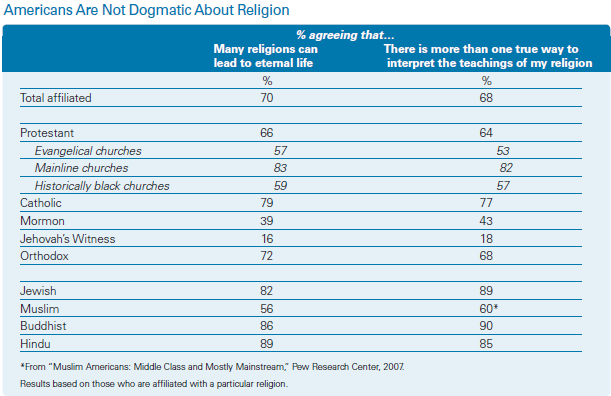 The lack of dogmatism in American religion may well reflect the great diversity of religious affiliation, beliefs and practices in the U.S. For example, while more than nine-in-ten Americans (92%) believe in the existence of God or a universal spirit, there is considerable variation in the nature and certainty of this belief. 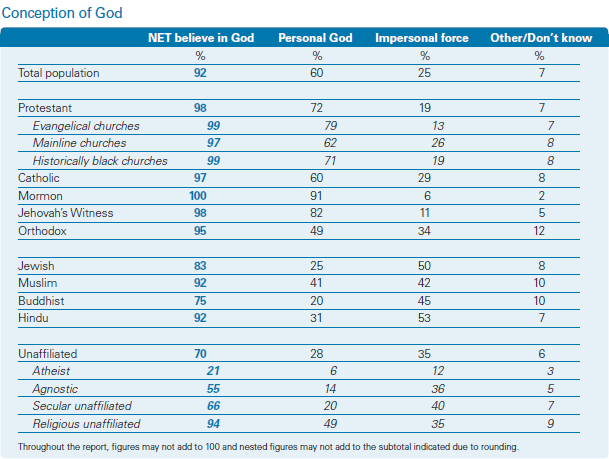 Six-in-ten adults believe that God is a person with whom people can have a relationship; but one-in-four – including about half of Jews and Hindus – see God as an impersonal force. And while roughly seven-in-ten Americans say they are absolutely certain of God’s existence, more than one-in-five (22%) are less certain in their belief. A similar pattern is evident in views of the Bible. Nearly two-thirds of the public (63%) takes the view that their faith’s sacred texts are the word of God. But those who believe Scripture represents the word of God are roughly evenly divided between those who say it should be interpreted literally, word for word (33%), and those who say it should not be taken literally (27%). And more than a quarter of adults – including two-thirds of Buddhists (67%) and about half of Jews (53%) – say their faith’s sacred texts are written by men and are not the word of God. The diversity in religious beliefs and practices in the U.S. in part reflects the great variety of religious groups that populate the American religious landscape. The survey finds, for example, that some religious groups – including Mormons, Jehovah’s Witnesses and members of historically black and evangelical Protestant churches – tend to be more likely to report high levels of religious engagement on questions such as the importance of religion in their lives, certainty of belief in God and frequency of attendance at religious services. Other Christian groups – notably members of mainline Protestant churches and Catholics – are less likely to report such attitudes, beliefs and practices. And still other faiths – including Jews, Buddhists, Hindus and Muslims – exhibit their own special mix of religious beliefs and practices. The Landscape Survey also reveals that people who are not affiliated with a particular religious tradition do not necessarily lack religious beliefs or practices. In fact, a large portion (41%) of the unaffiliated population says religion is at least somewhat important in their lives, seven-in-ten say they believe in God and more than a quarter (27%) say they attend religious services at least a few times a year. practices but also their basic social and political views. For instance, Mormons and members of evangelical churches tend to be more conservative in their political ideology, while Jews, Buddhists, Hindus and atheists tend to be more politically liberal than the population overall. But the survey shows that there are important differences within religious traditions as well, based on a number of factors, including the importance of religion in people’s lives, the nature and certainty of their belief in God, and their frequency of prayer and attendance at worship services. One of the realities of politics in the U.S. today is that people who regularly attend worship services and hold raditional religious views are much more likely to hold conservative political views while those who are less connected to religious institutions and more secular in their outlook are more likely to hold liberal political views. These are among the key findings of a major survey on religion and American life conducted by the Pew Forum on Religion & Public Life between May 8 and Aug. 13, 2007, among a representative sample of more than 35,000 Americans. The first report based on the U.S. Religious Landscape Survey was issued in February 2008 and focused on the religious affiliation of the American people, including the impact of immigration and changes in affiliation. This report provides information on the core religious beliefs and practices as well as the basic social and political views of the various religious traditions in the U.S. as well as people who are not affiliated with a particular religion. The report includes information on members of many religious groups – such as Mormons, Jehovah’s Witnesses, Jews, Buddhists, Muslims, Hindus, atheists and agnostics – that are too small to be analyzed in most public opinion surveys. More detailed tables, provided in Appendix 2, also summarize the basic beliefs, practices, and social and political attitudes of a dozen Protestant denominational families and 25 of the largest Protestant denominations in the U.S. These detailed tables also include information on what the survey classifies as “other Christians,” which includes such smaller groups as Spiritualists and other Metaphysical Christians, as well as on members of a variety of other faiths, including Unitarians and New Age groups. Americans display a high degree of similarity on some basic religious beliefs. For instance, Americans are nearly unanimous in saying they believe in God (92%), and large majorities believe in life after death (74%) and believe that Scripture is the word of God (63%). But a closer look reveals considerable diversity with respect to both the certainty and the nature of these beliefs. Americans’ beliefs about God are a good example of this diversity. 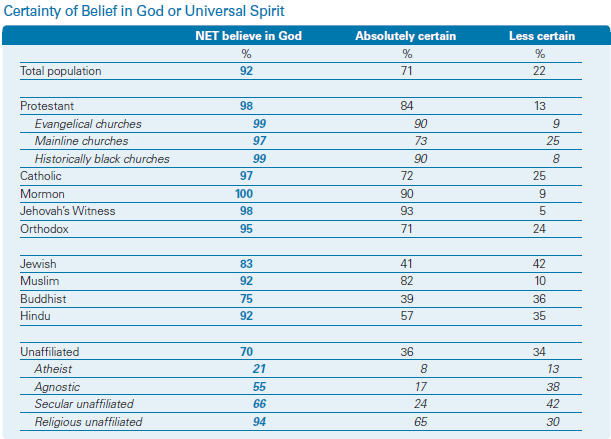 Nearly all adults (92%) say they believe in God or a universal spirit, including seven-in-ten of the unaffiliated. Indeed, one-in-five people who identify themselves as atheist (21%) and a majority of those who identify themselves as agnostic (55%) express a belief in God or a universal spirit. unanimity; for instance, roughly seven-in-ten members of mainline Protestant churches (73%), Catholics (72%) and Orthodox Christians (71%) are absolutely certain that God exists. Like their Christian counterparts, majorities of Jews (83%), Buddhists (75%), Hindus (92%) and the unaffiliated (70%) express a belief in God, but these groups tend to be less certain in their belief; only 57% of Hindus, and fewer than half of Jews (41%), Buddhists (39%) and the unaffiliated (36%) say they are absolutely certain of God’s existence. A similar diversity is apparent when it comes to the nature of the beliefs about God that members of different religious groups hold. For instance, the vast majority of Mormons (91%), Jehovah’s Witnesses (82%) and members of evangelical (79%) and historically black (71%) Protestant churches say they view God as a person with whom they can have a relationship. Smaller majorities of members of mainline Protestant churches (62%) and Catholics (60%) also hold this view. By contrast, a majority of Hindus (53%), along with half of Jews (50%) and pluralities of Buddhists (45%) and the unaffiliated (35%), say they view God not as a person but rather as an impersonal force. Authority of Scripture and Tradition. More than six-in-ten Americans (63%), including majorities of many religious traditions, view their religion’s sacred texts as the word of God. This belief tends to be most common among Christians. More than eight-in-ten Jehovah’s Witnesses (92%), Mormons (91%) and members of evangelical (88%) and historically black (84%) Protestant churches view the Bible as the word of God, as do majorities of Catholics (62%), mainline Protestants (61%) and Orthodox Christians (59%). Muslims, too, hold a high view of Scripture, with 86% viewing the Koran as the word of God. By contrast, Buddhists (67%), the unaffiliated (64%), Jews (53%) and Hindus (47%) are more likely to view the Scripture as the work of men than as the word of God. A plurality of adults (44%) who are affiliated with a particular faith say their religion should preserve its traditional beliefs and practices. Roughly one-third (35%) say their religion should adjust to new circumstances, and one-eighth (12%) say their religion should adopt modern beliefs and practices. Majorities of Mormons, Jehovah’s Witnesses and members of evangelical churches, along with nearly half of members of historically black churches, say their religion should preserve its traditional beliefs and practices. By contrast, majorities of members of mainline churches and Catholics, as well as Jews, Muslims, Buddhists and Hindus, favor adjusting to new circumstances or adopting modern beliefs and practices. Most Americans (74%) believe in life after death, with an equal number saying they believe in the existence of heaven as a place where people who have led good lives are eternally rewarded. Belief in the afterlife tends to be particularly common among the Christian traditions. But the survey also finds that roughly six-in-ten Buddhists (62%) believe in nirvana, the ultimate state transcending pain and desire in which individual consciousness ends, and about the same number of Hindus (61%) believe in reincarnation, that people will be reborn in this world again and again. By contrast, fewer than half of the unaffiliated (48%) and only about four-in-ten Jews (39%) say they believe in an afterlife. Belief in hell, where people who have led bad lives and die without repenting are eternally punished, is less common than is belief in life after death or heaven, with about six-in-ten Americans (59%) expressing belief in hell. In every religious tradition, including all the Christian traditions, belief in hell is at least slightly less prevalent than belief in heaven. 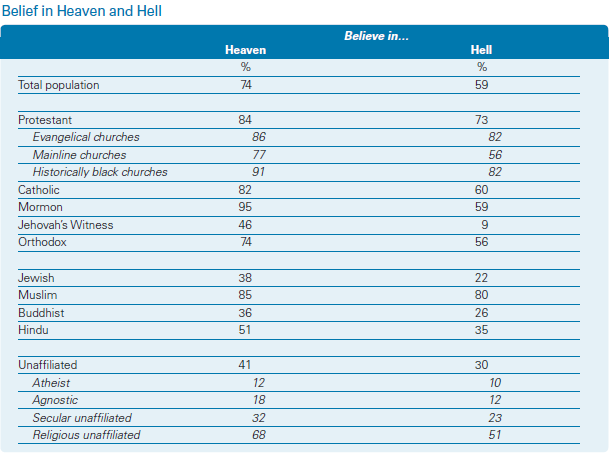 Belief in hell tends to be most common among members of the various Christian traditions, with relatively few Hindus (35%), Buddhists (26%), unaffiliated (30%) and Jews (22%) saying they believe in hell. As with belief in life after death, belief in the supernatural is also quite common. Nearly eight-in-ten American adults (79%), for instance, agree that miracles still occur today as in ancient times. 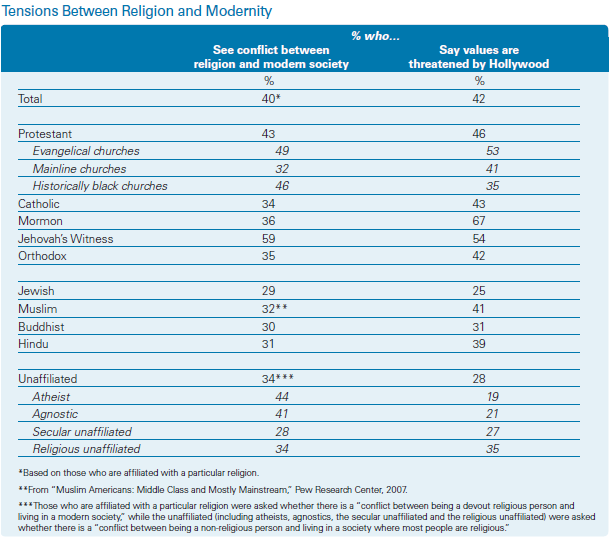 But here again, the intensity with which people hold these beliefs varies considerably across religious groups. For instance, eight-in-ten Mormons completely agree that miracles still occur today, as do large majorities of members of evangelical (61%) and historically black (58%) Protestant churches. Members of other religious groups, on the other hand, are less certain, with fewer than half saying they completely agree that miracles still occur today. Similar patterns exist with respect to beliefs about the existence of angels and demons. Nearly seven-in-ten Americans (68%) believe that angels and demons are active in the world. Majorities of Jehovah’s Witnesses (78%), members of evangelical (61%) and historically black (59%) Protestant churches, and Mormons (59%) are completely convinced of the existence of angels and demons. In stark contrast, majorities of Jews (73%), Buddhists (56%), Hindus (55%) and the unaffiliated (54%) do not believe that angels and demons are active in the world. The great diversity of religion in the U.S. is also reflected in religious practices. For instance, most Americans (54%) say they attend religious services fairly regularly (at least once or twice per month), with about four-in-ten (39%) saying they attend worship services every week. Frequent church attendance is particularly common among Jehovah’s Witnesses (82% of whom attend church at least once a week), Mormons (75%) and members of historically black (59%) and evangelical (58%) Protestant churches. By comparison, attendance at religious services is a less common practice among Catholics (42% of whom say they attend church at least once a week) and members of mainline Protestant churches (34%). Even smaller numbers of Hindus (24%), Buddhists (17%), Jews (16%) and the unaffiliated (5%) say they attend religious services at least once a week. The Landscape Survey reveals similar patterns in congregational involvement outside of worship services. Majorities of Mormons (77%), Jehovah’s Witnesses (76%) and members of historically black (60%) and evangelical (54%) Protestant churches, for example, participate at least once or twice a month in congregational activities such as musical programs, volunteering, working with children or social activities. Members of these religious traditions also tend to be most likely to participate regularly in prayer groups, Scripture study groups or religious education programs. Catholics and members of mainline Protestant churches, by comparison, tend to be less connected to their congregations in these ways, as are Jews, Buddhists and Hindus. Americans also engage in a wide variety of private devotional activities. Nearly six-in-ten (58%), for instance, say they pray every day, with majorities of most religious traditions saying they pray daily. Daily prayer is most common among Jehovah’s Witnesses (89%), Mormons (82%) and members of historically black (80%) and evangelical (78%) Protestant churches. A smaller number of Catholics and members of mainline Protestant churches, though still a majority (58% and 53%, respectively), say they pray daily. 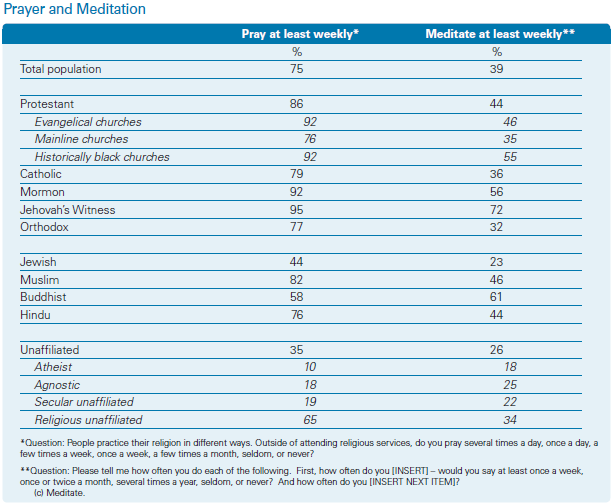 By contrast, only 45% of Buddhists, 26% of Jews and 22% of the unaffiliated say they pray daily. Roughly six-in-ten Hindus (62%) say they pray at a shrine or other religious symbol in their home at least once a week, as do one-third of Buddhists (33%). Meditation is a less common practice than is prayer, with four-in-ten adults (39%) saying they meditate at least once a week, compared with three-quarters of Americans who say they pray at least once a week. But meditation is a regular practice among most Buddhists (61% meditate at least once a week) and is also practiced on a weekly basis by majorities of Jehovah’s Witnesses (72%), Mormons (56%) and members of historically black churches (55%). Fewer members of other religious traditions meditate on a weekly basis, including just 26% of the unaffiliated and 23% of Jews. A significant minority of Americans say their prayers result in definite and specific answers from God at least once a month (31%), with nearly one-in-five adults (19%) saying they receive direct answers to specific prayer requests at least once a week. More than half of Mormons (54%) say they receive responses to prayer at least once or twice a month, as do half or nearly half of members of historically black churches (50%), Jehovah’s Witnesses (49%) and members of evangelical Protestant churches (46%). These are largely the same groups – Jehovah’s Witnesses are the exception – that also are most likely to say they have experienced or witnessed a divine healing of an illness or injury. By contrast, members of most other religious traditions tend to be less likely to report familiarity with this kind of direct interaction with the divine. Most parents in the U.S. report engaging in a variety of religious activities with their children. More than six-in-ten parents (63%) with children at home, for instance, say they pray or read Scripture with their children, while nearly as many (60%) send their children to religious education programs. Mormons and members of historically black and evangelical churches stand out as particularly likely to pursue these activities with their children, though many parents in other religious groups also engage in these activities. Two-thirds of Hindus, for instance, pray or read Scripture with their children, and roughly six-in-ten members of mainline churches (62%), Jews (56%) and Orthodox Christians (58%) send their children to religious education programs. Far fewer parents (15%) choose either to send their children to religious schools instead of public schools or to home school them. Interestingly, though, this practice is most common among Jews (27%) and Orthodox Christians (30%), two groups that do not tend to stand out for high levels of religious involvement on many other measures. About one-in-three affiliated adults (36%) say they share their faith with others at least once a month. Nearly half (47%) say they seldom or never share their faith or views on God with people from other religious backgrounds, and an additional 14% say this is something they do only once or twice a year. Here again, however, certain groups stand out for the emphasis they place on sharing their faith. More than eight-in-ten Jehovah’s Witnesses (84%) share their faith with others every month, as do 55% of members of historically black churches, 52% of members of evangelical churches and 47% of Mormons. This practice is less common among most other religious traditions. More than three-quarters of American adults (78%) believe there are absolute standards of right and wrong, with a majority (52%) saying they rely primarily on practical experience and common sense for guidance regarding right and wrong. Far fewer say they rely mainly on their religious beliefs (29%), and fewer still say they rely on philosophy and reason (9%) or scientific information (5%). Only among Jehovah’s Witnesses (73%), Mormons (58%) and members of evangelical churches (52%) do majorities say they rely primarily on their religion for guidance about right and wrong. A solid majority of Americans (62%) reject the idea that religion causes more problems in society than it solves. This figure includes majorities of most Christian traditions and more than two-thirds of Muslims (68%). In contrast, nearly half of Jews (49%) and more than half of Buddhists (56%), Hindus (57%) and the unaffiliated (59%) say religion causes more problems than it solves. Indeed, more than three-quarters of atheists (77%) believe religion causes more problems than it solves, with nearly half (49%) of atheists completely agreeing with this statement. Although a majority of Americans (54%) who have a particular religious affiliation say they do not see a conflict between being a devout person and living in a modern society, a substantial minority across nearly all religious traditions believe that such a tension exists. This view is particularly prevalent among Jehovah’s Witnesses (59% say there is a conflict between being devout and living in a modern society) as well as members of evangelical and historically black Protestant churches, among whom 49% and 46%, respectively, share this view. Overall, those who attend religious services at least once a week (44%) or who say religion is very important in their lives (44%) are more likely to say there is a conflict than those who attend worship services less often (35%) or who say religion is less important in their lives (31%). Interestingly, a substantial number of adults who are not affiliated with a religion also sense that there is a conflict between religion and modern society – except for them the conflict involves being non-religious in a society where most people are religious. For instance, more than four-in-ten atheists and agnostics (44% and 41%, respectively) believe that such a tension exists. Many Americans also see a conflict between their values and popular culture, as is evident in people’s views of Hollywood and the entertainment industry. Although a majority of adults (56%) reject the idea that Hollywood poses a threat to their values, a significant minority (42%) perceives such a threat. Among adults who are affiliated with a particular religious tradition, nearly half (45%) say Hollywood threatens their values. Concern with the values of the entertainment industry is particularly high among Mormons (67%), Jehovah’s Witnesses (54%) and members of evangelical Protestant churches (53%). The level of concern tends to be strongest among the most religiously active adults, as measured by such factors as frequency of prayer and attendance at worship services. A majority of Americans (59%) are very satisfied with their personal lives. Those who are affiliated with a religious tradition are somewhat more satisfied with their lives than those who are not (60% to 54%). And people who attend worship services at least once a week report higher levels of satisfaction with their personal lives (65%) compared with those who attend religious services less often (55%). Despite their overall feelings of satisfaction with their personal lives, and even higher levels of satisfaction with their family lives, only about a quarter of U.S. adults (27%) say they are satisfied with the way things are going in the country (as of the summer of 2007 when the survey was conducted). Members of historically black churches (17%) and Jehovah’s Witnesses (10%) are among the least satisfied with the overall direction of the country. The Landscape Survey also finds that about one-quarter of the public (27%) is satisfied with the way the political system is working. No more than a third of any religious group expresses overall satisfaction with the way the political system is working, with the exception of Mormons (36% of whom are very or somewhat satisfied). Relatively few adults (14%) cite their religious beliefs as the main influence on their political thinking – about the same number as cite their education as being most important (13%). Far more cite their personal experience (34%) as being most important in shaping their political views. An additional 19% identify what they see or read in the media as the most important influence in shaping their political views. But despite Americans’ general reliance on practical experience in shaping their political thinking, the Landscape Survey confirms that there are strong links between Americans’ views on political issues and their religious affiliation, beliefs and practices. In fact, religion may be playing a more powerful, albeit indirect, role in shaping people’s thinking than most Americans recognize. themselves as Republican or leaning toward the Republican Party. At the other end of the political spectrum, Jews, Buddhists, Hindus and the unaffiliated are much more likely than members of most other religious groups to describe their political beliefs as liberal. When it comes to partisanship, more than three-quarters of members of historically black churches favor the Democratic Party, as do two-thirds of Jews and Buddhists and majorities of Muslims (63%), Hindus (63%) and the unaffiliated (55%). The connection between religious affiliation and politics appears to be especially strong when it comes to certain issues, particularly those that have been at the forefront of the “culture war” controversies of recent years. 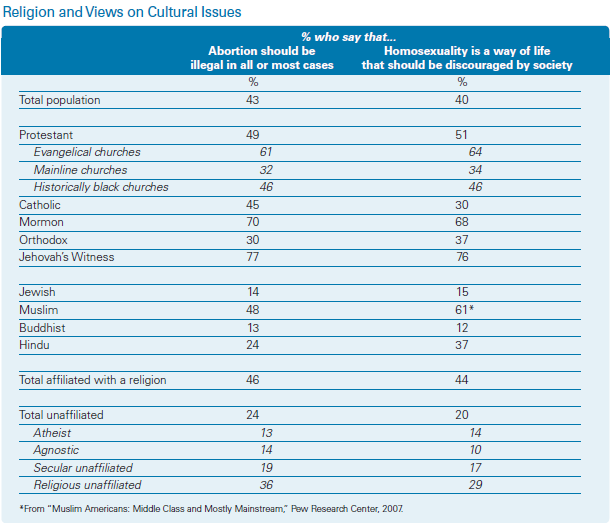 Some religious traditions, for instance, are overwhelmingly opposed to abortion; seven-in-ten Mormons and six-in-ten members of evangelical churches (61%) say abortion should be illegal in most or all circumstances. On the other side of the issue, six-in-ten members of mainline churches (62%) and seven-in-ten of the unaffiliated say abortion should be legal in most or all instances. A similar divide exists on the question of whether homosexuality is a way of life that should be discouraged or accepted by society. But there are other political issues on which there is more agreement across religious traditions. On the question of government’s role in providing aid to the needy, for instance, large majorities of most religious traditions agree that the government should do more to help needy Americans, even if it means going deeper into debt. A similar consensus exists across the board with respect to basic views on the environment, with majorities of most religious groups saying that stricter environmental laws and regulations are worth the cost. And majorities within most religious traditions say that diplomacy rather than military strength is the best way to ensure peace. The survey also confirms the connection that exists between religious intensity and social and political views. Across a variety of religious traditions, those who say that religion is very important in their lives, express a more certain belief in God, or pray or attend worship services more frequently tend to be much more conservative in their political outlook and more Republican in their party affiliation. As with affiliation, the connection between religious engagement and political attitudes appears to be especially strong when it comes to social issues such as abortion and homosexuality. For instance, nearly three-in-four (73%) members of evangelical churches who attend church at least once a week say abortion should be illegal in most or all cases, compared with only 45% of members of evangelical churches who attend church less frequently. The survey finds a similar pattern among several religious traditions, including members of mainline and historically black Protestant churches, Catholics, Mormons, Orthodox Christians and Jews; the more active members of these traditions tend to be more likely to oppose legalized abortion compared with members of the same traditions who attend worship services less frequently. Views of whether homosexuality is a way of life that should be discouraged or accepted by society follow a similar pattern. But the survey also finds that views on other political issues, such as environmental regulations and the role of government, tend to vary less based on level of religious involvement. The U.S. has largely avoided the secularizing trends that have reshaped the religious scene in recent decades in European and other economically developed nations – but not entirely. The Landscape Survey documents, for example, that the number of Americans who are not affiliated with a religion has grown significantly in recent decades, with the number of people who today say they are unaffiliated with a religious tradition (16% of U.S. adults) more than double the number who say they were not affiliated with a religion as children (7%). It remains to be seen how this trend toward secularization will ultimately impact religion in the U.S. But what is clear is that religion remains a powerful force in the private and public lives of most Americans, a fact amply illustrated by the findings of the U.S. Religious Landscape Survey discussed in this report. The chapters that follow amount to a topic-by-topic reference source on Americans’ religious beliefs and practices as well as the social and political views of the numerous religious traditions. Interactive online tools available at www.pewforum.org allow users to delve deeper into many of the survey findings, including religious affiliation and newly added data on religious beliefs and practices as well as social and political views.